TS NPDCL Sub Engineer Recruitment Notification 2018 - 497 Vacancies Apply Online : TS NPDCL Sub Engineer 497 Posts Recruitment Notification 2018 – Telangana NPDCL Sub Engineer Apply Online Application form at www.tsnpdcl.in. Telangana Northern Power Distribution Company Limited (తెలంగాణ రాష్ట్ర ఉత్తర పవర్ పంపిణీ సంస్థ) released TSNPDCL Notification 2018 to fill Sub Engineer 497 Posts vacancies. Apply Online for TS NPDCL JLM Posts on or before 18th June 2018. Who are Eligible Candidates Apply for 497 vacancies, Applications are invited On-line from qualified candidates through proforma application to be made available on tsnpdcl.cgg.gov.in website to the post of Sub-Engineer (Electrical). The Company caters to supply of electricity in districts of Mancherial, Nirmal, Kumram Bheem, Kamareddy, Peddapalli, Jagtial, Rajanna Siricilla, Warangal Urban, Warangal Rural, Mahabubabad, Prof Jayashankar, Jangaon, Bhadradri Kothagudem, Adilabad, Nizamabad, Karimnagar and Khammam Districts. Telangana Northern Power Distribution Company Limited has issued TSNPDCL Notification 2018 for the recruitment of young, talented & dynamic applicants for 497 Sub Engineer Posts. Eligible candidates may apply Online through official website of Northern power Distribution company Limited Telangana State for Sub Engineer Electrical Vacancies of 497. 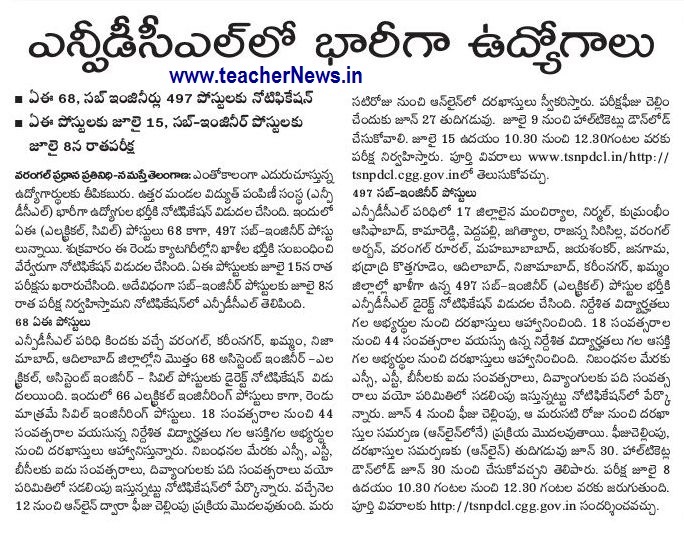 Schedule foe Fee Payment submission of Online application Form Exam Dates Download of Hall Tickets Results. Firstly, visit the official website www.tsnpdcl.in or directly click on the link attached below. 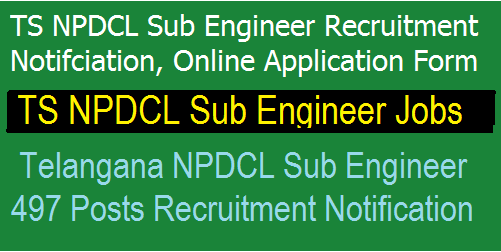 On the homepage of the official website, check “497 Sub Engineer www.tsnpdcl.in TS NPDCL Jobs Notification” link. Read the instructions & guidelines provided in the official Telangana Electricity Department Notification 2018 carefully. Check whether you are eligible for TSNPDCL Junior Lineman Jobs or not. If eligible, then click on “TSNPDCL Sub Engineer Apply Online” tab. Fill the TSNPDCL Application form 2018 with Personal, Academic & other information. Pay the application fee & Upload the scanned images of photo & signature. Recheck all the details once before applying for TSNPDCL Jobs. Finally, click on “Submit” button & keep the hard copy of the TSNPDCL Online application form 2018 for further reference. Online Application Processing Fee : Each applicant must pay Rs.100/- (RUPEES ONE HUNDRED ONLY) towards Online Application Processing Fee. Examination Fee : This apart, the applicants have to pay Rs.120/- (RUPEES ONE HUNDRED AND TWENTY ONLY) towards Examination Fee. Note : SC/ST/BC Communities are exempted from payment of examination fee. Minimum 18 years and maximum 44 years. The age is reckoned as on 01.01.2018. Must have a Diploma in Electrical Engineering (DEE) (or) Diploma in Electrical & Electronics Engineering(DEEE) or Graduation in Electrical Engineering in addition to Diploma in Electrical Engineering (or) Electrical & Electronics Engineering or any other equivalent qualification recognized by the Board/University of United Govt. of A.P./T.S/India/ UGC/DEC/AICTE as the case may be. The hall tickets will be placed on the website seven days prior to the date ofexamination. The candidate has to down load the Hall ticket from the website only. Hall tickets will not be sent to the candidates by post. The written examination for recruitment of Sub-Engineer/Elecl. will beheld on 08-7-2018 from 10.30 AM to 12.30 PM. The written examination for recruitment Sub-Engineer/Elecl. will beheld at different centers located in the GHMC area, Hyderabad & GWMC area of Warangal. TS NPDCL Sub Engineer Recruitment Notification 2018 - 497 Vacancies Apply Online at tsnpdcl.cgg.gov.in.Telangana NPDCL Sub Engineer 497 Posts Recruitment Notification Apply Online Details.